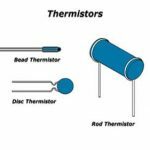 Home / Electronics Articles / What is thermistor? 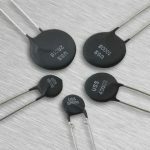 The thermistor is made up of ceramic like semi-conducting materials such as copper oxide, manganese oxide, nickel oxide, cobalt oxide, titanium oxide and lithium oxide. 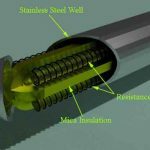 These oxides are blended in a suitable proportion and compressed into the desired shapes from the mixed powers and heat treated to recrystallise them, resulting in a dense ceramic body with the required resistance temperature characteristics. As the temperature increases, its resistance decreases and vice versa and this is called as negative temperature characteristic of thermocouple. The thermistor is a very non linear instrument where as resistors such as platinum, copper and tungsten are quite linear. The resistance temperature relation for thermistor is given below. R = Resistance at any temperature (T). R0 = Resistance at the reference temperature (T0). β = 3000 K to 4500 K depending on its composition. The practical operating range of thermistor lies between -100 to +300 Celsius. Normally thermistor shows NTC characteristics but some specially designed shows PTC characteristics up to some specified range.